You don’t need to break the bank to turn your garden into a peaceful haven. Your garden should be a space where you can relax and enjoy the fruits of your planting labours, without worrying that you’re not making enough use of your outdoor area. Don’t be afraid to get your hands dirty and think outside the box. 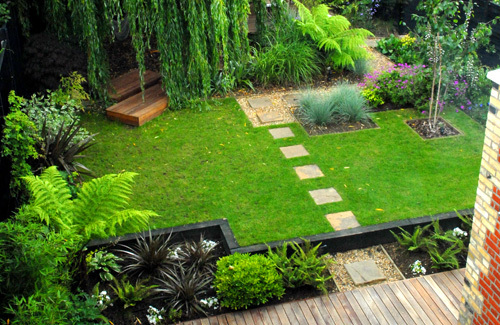 Often the most creative garden solutions are the cheapest and most effective. Forget traditional plant pots and embrace a variety of containers for your potted plants. You can use tin cans or even plastic yoghurt pots, dipped in brightly coloured paint. Look for old china in charity shops and use teapots and teacups to house your potted plants. You can guarantee that this will set your garden apart from the others. Herbs can be planted in canvas shoe tidies and hung just outside the back door for ease of access. To create a unique front garden display, try painting plant pots with your house number, one number per pot. Choose long-lasting varieties for these pots, so that they stay green all year round. If you want a patio space where you can sit with friends and enjoy warm summer evenings, a mismatched collection of bricks and slabs can look very effective. Wooden decking tends to be more expensive, so it may be worth looking into a composite wood-plastic solution like Dura Deck. Once you have your decking or patio laid, you can fill it with comfortable outdoor furniture and DIY lighting. For cheap garden furniture options scour car boot sales and sites like Freecycle. Often items are being given away. Try stringing fairy lights along a porch awning or putting tea lights in glass jars for intimate outdoor lighting. Instead of shelling out for commercial fertilizer, start your own compost bin. You can buy an inexpensive plastic drum and fill it with green cuttings, vegetable peelings, egg shells, teabags and newspaper to create a highly nutritious compost for your garden and cut down on the amount of household waste that you send to landfill at the same time. If you find garden centres too pricey, why not ask a green-fingered friend whether they will make cuttings of their plants for you? Use these free cuttings to supplement your garden instead of buying plants commercially.